The Last Temptation of Number Six. -That's all you get for giving the Village everything: your own clothes, a roar of vague but somewhat deranged approval, and a chair that matches your eyes. -I love the sentimental music when they haul 2 out of the trailer. They're treating him for all the world like a beloved, nostalgic sitcom character coming out for his cameo -- even before he arises from the dead to the sound of his own laugh track, looking with bewilderment at the crowd roaring with delight at his clips. -There are direct nods to 1's identity long before the unmasking: when 1 gives the order to switch to Dad Speak, it's 6 that the judge thanks. -Look, I'm going to go on record here as thinking "Fall Out" is a work of deranged brilliance -- a complement to the drama and weight of "Once Upon a Time" that never equals its emotional power, but has other consolations. But I also think this whole sequence with Kanner is exhausting and tries to dilute maybe two minutes of magnetic performance into six minutes of running and rambling. I never fully got it about Kanner. -Nobody in "Fall Out" actually has a name, or even a number; we are told to stop using "6," and you could make a plausible case that 48's name is the sound of bells and 2's is the sound of laughter (with which the judge introduces him). -"Look me in the eye," says 2, and as he steps toward the silo, two glass eyes meet -- McKern's own has never looked glassier. Not sure what that means, but it's cool. -The judge's speeches (which Griffith was apparently asked to write himself) don't have much point or value, but I think that's why they're there. He's trying to make a narrative of something that lost coherent narrative a long time ago. What 48's rebellion means isn't at all equivalent to what 2's rebellion means, and neither of them can be opposed to 6's. The three men are, in fact, natural allies, and they flee together as a weird trinity. -6's last temptation is as small-time as his first reward: not all the kingdoms of the world, but the key to his house, a small cash prize, and his long-delayed holiday. And he takes it, of course. -That's success: they'll scream their approval so loudly that you can't hear yourself. But more than that, this sequence is about 6 trapped in his own brain, with I or 1 or whatever you want to call it, and no way out. -I really love the idea that 1 is 6 -- I mean I really really love it, and think it's the largest freestanding metaphor ever erected on television -- but I also love the idea that 1 is a gigantic, meaningless ICBM. -And that was "Fall Out"! Confused, grand, padded, triumphant, much loved and much hated, the television episode that ostensibly drove Patrick McGoohan out of Britain for good. Let's talk amongst ourselves, but first, let me just say that these threads have been a pleasure, and it's been revelatory to watch the thing in company and in proper order. Oh god, Dem Dry Bones. May I never hear that song again. I like Dem Bones, I like what it's doing in the episode, and I couldn't agree more. I don't know what to make of this episode overall. 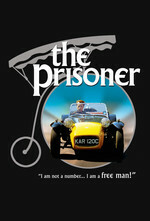 The Prisoner was very good at using metaphor and allegory throughout it's run, while still keeping itself seeming real. "Once upon a time" walked right up to the line. "Fall Out" backed up a few paces, and took a running leap into the abyss. Ultimately I'd place it as a failed attempt to have an allegorical summation of the themes and ideas of the series as an ending. On the other hand, I'm the sort of person who likes ambitious failures so I really enjoyed the episode. The use of contemporary (for the time) music in this episode is rather jarring. It becomes glorious when they start laying waste with machine guns "All you need is love" and ammunition apparently. McKern's speech is interesting because it establishes again, that's he changed places with 6. He's become the one laughing at The Village and spitting in it's eye. The DC comic "Shattered Visage" (a kind of sequel comic to the series) has one of the characters make a point about the ICBM. That's the point of the village; raw power, all the Rococo stuff outside is just set dressing. Which I like, and rings true with this episode. The Village looks like a seaside resort outside, inside it's all steel walls and nasty bits of electronics. As muddled as the episode is, it's still full of neat touches. I really liked the fact that the silo-one 'speaks' in what turns out to be distorted versions of the radar or countdown bleeps we hear when 6 meets him. I'm also pretty sure it was deliberate that 6's old house now has an automatic door that opens for Angelo Muscat, and that he's still credited as "Prisoner". He's not really out. 2 is dressed up and walking through Westminster, he's back to being a person of importance, and Kanner, presumably, is trying to find his way to the OK Corral. Nobody's really escaped, and not a lot has changed. Hell, maybe that's the point in the end McKern's prophecy "The whole world as The Village" is true. At any rate, thanks to DevilsAdvocate for starting it, thesmallmachine for keeping it going, and everyone who's commented through this rewatch. I've gotten a lot out of the series this time through that I hadn't before because of it. This post has some more tags which might be useful here. Could someone clarify just what Dem Bones is doing in this episode? I never quite understood the point. And yeah, it would have gone down a lot easier if it hadn't gone on so long. I love the idea of this episode, and I kind of love the episode itself, but it's just not fun to watch for the most part. I guess that description applies to a good 4-5 other Prisoner episodes too, so maybe not so surprising. I will still accept 'Fall Out' as one of the greatest ways to end a series. The first time around I saw it as The Prisoner triumphing over the Village to such an extent that he surpasses the very format of the show itself. This was probably fed by the idea that McGoohan wrote 'Fall Out' as a big 'f-you' to the studio and to the pressures of audience expectations. I don't remember where I read that, but it seems like a common idea. Is there an authoritative statement? Now I favor the idea that the Prisoner loses in a big way by accepting what they give him, and that No. 2 was setting him up. Either way, I like that the Prisoner didn't escape with his sanity. It's hard to articulate, but the way I've always interpreted "Dem Bones" is a little like the "secret" exposed at the end of Catch-22 -- Yossarian losing his mind when he's confronted with the grotesque fragility of the human body. You've got these characters who have been broken in so many ways, down to the point where "I'm human, I'm a being of flesh and blood" is the only fact they can really trust, and thus the obsessive repeating of the song, which is both triumphant and the signal of total breakdown. The song itself is about resurrection (and, metaphorically, the restoration of Israel), and McGoohan might have had a Christian meaning in mind -- hell, the whole episode is full of vaguely Christian images, from the trinities to the actual resurrection of 2 -- but I've never read much into that, seeing it mostly just as another fragmented part of 6's psyche. It also highlights 48s American-ness. Which is emphasized again with references to his youth. Ezekiel is the source of many long lasting images. There is so much going on in this episode. It's hard to focus on something and follow it. I think that 2's laughter sounds like the sample at the opening of Gorillaz hit Feel Good. The Judge insists that Our Hero, successful in his individual quest, become their leader. The audience, the chorus, is so enthralled by him they descend into individualist chaos. The Judge knows this. Elaine Scarry writes about the thermonuclear monarchy, the unaccountable system that subverts democracy when political leaders have life and death power over millions. I like the idea that 1 is a nuclear missile. Our Hero never escaped the Village. And 1 is the number on the door. I'd love a modern remake. Not the terrible one with Caviezel and McKellen. Like this, just updated with Panopticon goodness and better drugs. Justify everything with terrorism instead of the Cold War.